Motion. As water flows through our lives, how does it move us? What e-motions are stirring when we witness the state of the Great Lakes? In 2016, from Mother’s Day to Thanksgiving, Great Lakes Commons rallied people across the waters to journey in unity. Walk, bike, paddle, sail, or surf to connect with the lakes and others who are becoming great ancestors -- guardians of the Great Lakes. In 2019, can you journey part of the Great Lakes this year and add motion to this ongoing movement. There is no better way to honour and protect the waters than being in constant contact with them. Take to the lakes this spring, summer, or fall by foot, paddle, bike, sail, or surf. We made a Journey Guide to help find our way. What ceremonies of gratitude can we offer? What harmful water issues can we learn about? What communities can we visit and highlight their struggles or successes? What protocols can we respect and share to show our responsibilities as great ancestors? What expressions of hope, grief, and beauty can make a Great Lakes Commons? What collective power can we harness crossing boundaries of place? May - August: Our Shores is a shoreline run all the way around Lake Superior collecting stories of care and concern. June - September: Children of the Wild perform their Wastelands Opera -- taking audiences on an outdoor, visceral journey through the seven stages of grief, weaving music, movement, imagery, and local testimony in connection with local struggles to protect the Great Lakes. May 29th: Walk for Water is a community rally from the centre of Guelph to the doorstep of Nestle's water bottling plant. "Water is for life, not for profit". June 4 & 5: Manitoulin Passage Ride is a weekend of cycling in the heart of the Great Lakes with food, art, music, and friendships. June 15-17: This 42-kilometer sacred water walk is a healing journey for the heavily polluted water in Hamilton Harbour. It is a grassroots initiative working with guidance from Indigenous grandmothers and other Water Walkers. July 1-9: Two Row on the Grand is a Haudenosaunee healing paddle down the Grand River to re-polish the chain of friendship with non-aboriginal neighbours. This journey offers a unique opportunity to not only paddle with the Haudenosaunee, but to partake in educational events, cultural teachings, interactive dancing, storytelling, environmental concerns, treaties and sharing circles. July 23 and 24: Children of the Wild, Bike the Line and Great Lakes Commons are hosting a two day commons convergence: Beyond Line 5 - at the McGulpin Point Lighthouse in Mackinaw City, MI. August 20: eXXpedition Great Lakes. Make the unseen seen and be part of the world's largest simultaneous water sampling for micro-plastics. Love Your Greats is hosting an 'exxpedition Great Lakes' to coordinate hundreds of volunteers sampling lakes Ontario, Erie, Huron, Michigan, Superior, and St. Clair and the Saint Lawrence river for microplastics -- all by boat, paddle, and foot. August 21: End of the Line Celebration. This summer, pipeline fighters in the Great Lakes embarked on 3 different journeys of resistance, on the land we are all fighting to protect. The dynamic duo of Sacred Waters Sacred Lands walked for 33 days on proposed Twin 66, across Wisconsin. The Honor the Earth team completed its 4th annual Love Water Not Oil tour, riding horse for 2 weeks along the route of the proposed Sandpiper and Line 3 corridor. And now, the fearless Bike the Line team is completing its almost 1,000 mile journey from Michigan to Superior, a door-to-door outreach effort to every home and community on the Line 5 pipeline route in an effort to get it shut down. August 22-September 1: Shawna Weaver's 310 mile run of the Superior Hiking Trail to celebrate the resilience of Lake Superior and the people working to sustain it. September 4: Body Commoning: becoming a Great Lakes commoner through movement and collaboration. September 4: Common Waters: performances, presentations, and stories from 3 Great Lakes journeyers: Children of the Wild, Shawna Weaver, and Ben Weaver. Contact us to collaborate on your water journey. We can share resources, networks, and ideas. 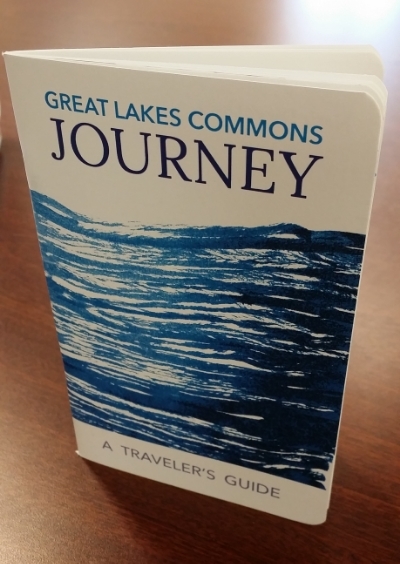 We also collect stories for blog posts and our Great Lakes Commons Map -- where you can add text, photos, or videos documenting your journey. You can read about many of the above journeys by exploring their paths on this commons map.